These Shredded Chicken Sliders pull double duty since they are both a delicious easy dinner or a perfect dish to show up with to a party! Since the sandwiches are small, it can scale from an appetizer to a full meal so it is perfect for feeding 4 or 24. With only a handful of ingredients, this dish comes together quickly and is a true family pleasing comfort food! As you guys know, this summer was CRAZY for us! We moved, we traveled and most of the time we didn’t have much of a kitchen. I came up with quite a few recipes that took quick and easy to the next level, letting me still get dinner made for the family no matter how little time (or kitchen space) we had, we could still make a meal happen. These pulled chicken sliders are one of those recipes. So quick. So easy. And so, so tasty! They are super simple but pack the taste in where it counts. And best of all… they are a real crowd pleaser! Both kids and adults will make these disappear fast. Depending on whether you are making these for an appetizer or a meal will give you different options on how you might want to serve them. Shredded chicken sliders are a simple sweet and savory sandwich, so it is hard to go wrong with what you serve it with, but here are some of my favorites! 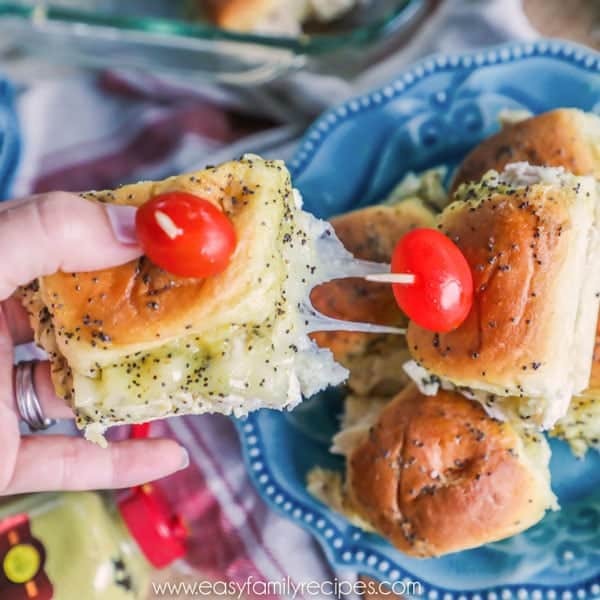 When you prepare the sliders as an appetizer, you can do it as simply as just piling them on a plate, or make it a little fancier by adding a tooth pick with a cocktail pickle or grape tomato. It makes a really nice presentation if you want to dress it up a little. Hopefully this gets you started on how to serve these sliders. If you have another favorite idea for serving, I would love to hear about it in the comments so I can give it a try! I am always looking for new ideas! Follow along with me below as I walk through this recipe step by step with all of my notes, tips and tricks for the recipe. Or if you are just wanting the quick version, feel free to scroll on down to the bottom of this post for the recipe card. 2 packages Kings Hawaiian Rolls– Kings makes all sorts of different types of rolls now, but you will want the Original Hawaiian Rolls for these sandwiches. 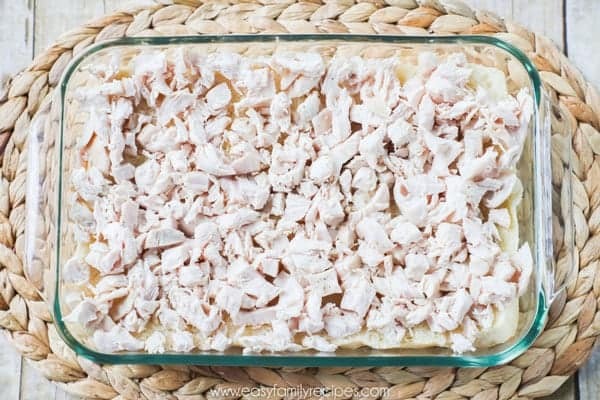 3 cups shredded chicken- You can pack in a little more chicken if you want but you will probably want at least three cups to really make them full. I love to use rotisserie chicken to make these, but you can also use any neutral flavored leftover chicken from another meal. 12 slices provolone cheese- I prefer the kind without smoke added, but you can your which ever kind you prefer. 4 tbsp dijon mustard- Using dijon mustard really gives this great flavor, don’t worry though, it isn’t strong once it is mixed together and spread on the sandwiches so it is still very kid friendly. 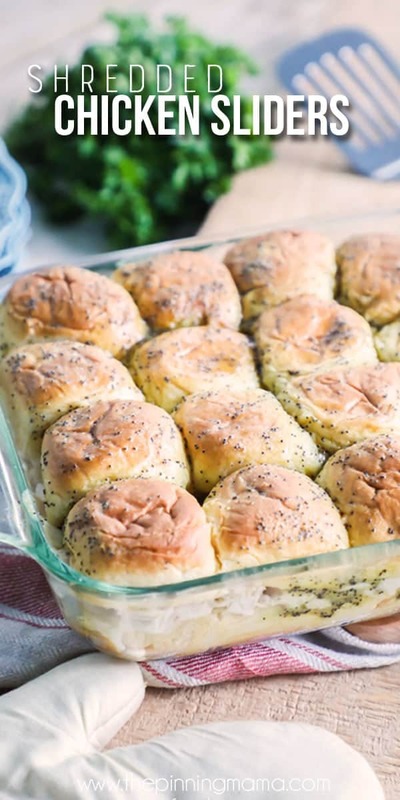 1 tbsp poppy seeds- These will add a nice subtle crunch to the sliders and enhance the flavors. 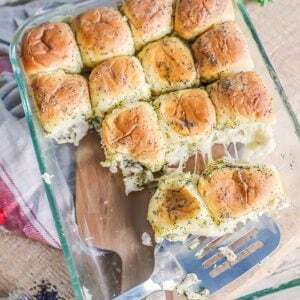 Cut each of the Hawaiian rolls in half across the length of the rolls and then place the bottoms in a 9×13 baking dish. 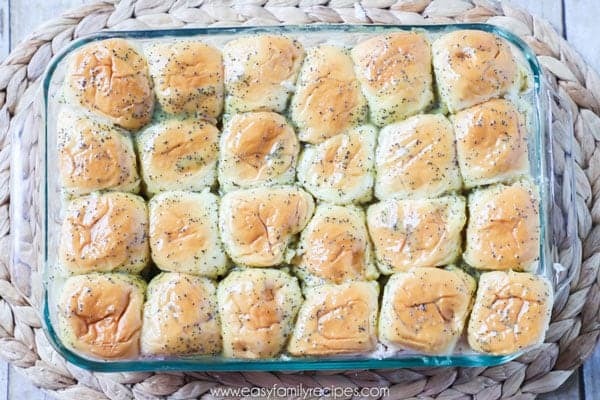 These rolls will fit pretty perfectly side by side in this sized baking dish as you can see in the pictures. 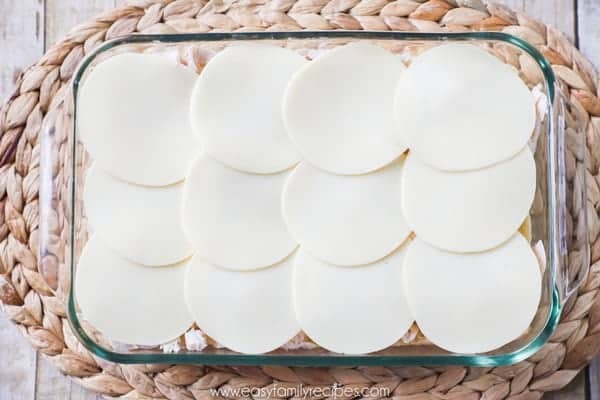 I have used several different types of these dishes and sometimes they have more rounded corners which makes it a little more challenging, but you should be able to still work them in. 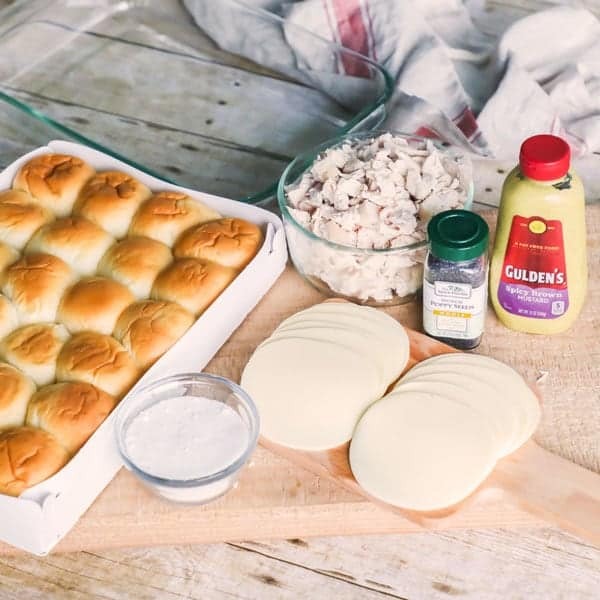 Layer the chicken and cheese on top of the rolls and then place the top back on. Use a serrated knife to cut in between all of the rolls. 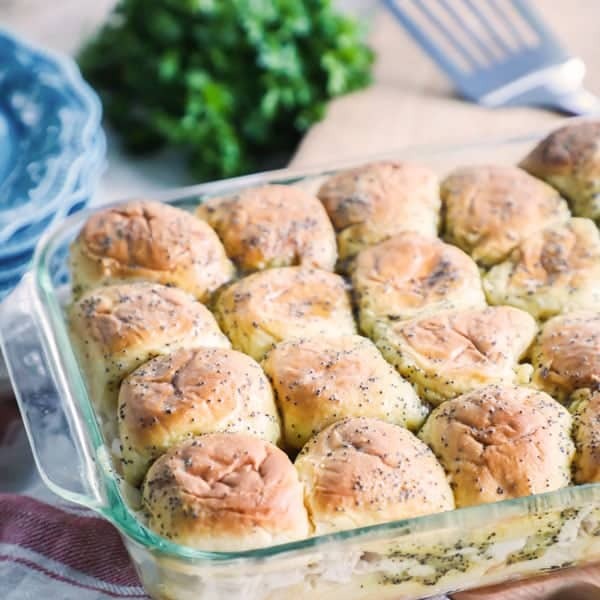 By cutting between the rolls you give the butter mixture a way to work its way down between the rolls and really allow the flavor to spread throughout the entire dish. Don’t skip this step! They just won’t be as good if the flavors can’t get in between all of the rolls. 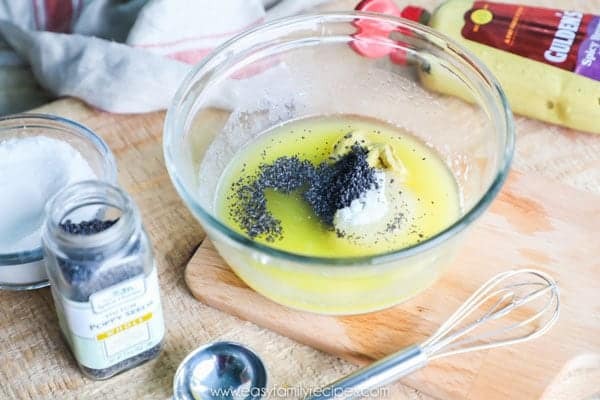 Mix the melted butter, mustard, sugar, and poppy seeds until combined. Then use a pastry brush to spread the mixture evenly over the tops of the rolls. 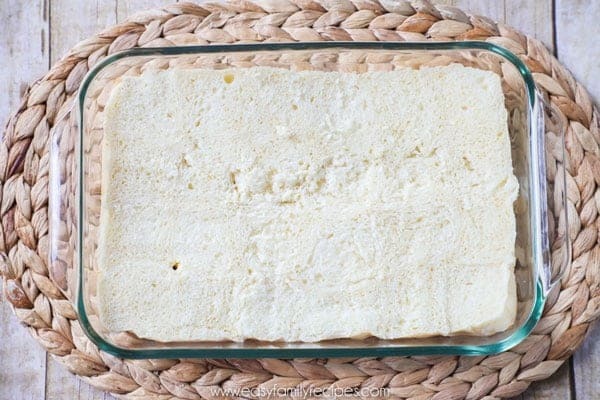 Brush it over the top and then use the remainder of the mixture to work some down between each of the rolls and around the sides until it is all used. Bake on the middle rack for 20 minutes or until the tops of the rolls are golden brown. Since everything in this is already precooked, it is just important to get the entire dish heated through and the cheese melted. If the rolls start to get too brown for your taste you can loosely cover it with foil. Serve hot with any of the suggestions above and most of all, enjoy! I hope you are able to enjoy this easy dish soon! It is a recipe that we come back to year after year in our family because it is so delicious, easy and everyone in the family loves it! If you do get a chance to try it, I would love to hear your thoughts in the comments. Or snap a pic and tag me on Instagram @easyfamilyrecipes. I would love to see what you are cooking up! 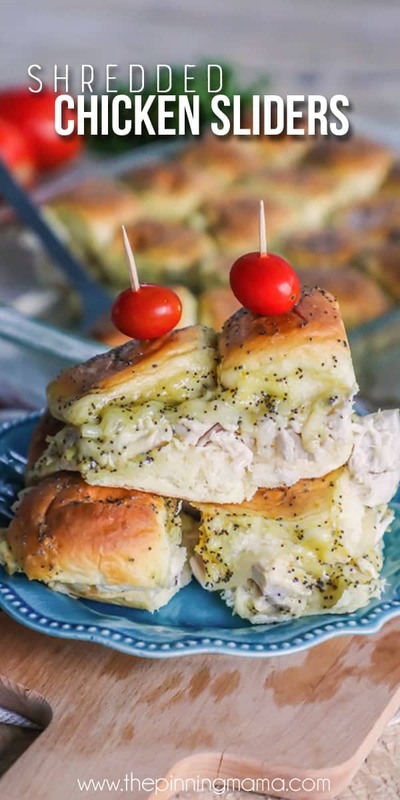 These easy Shredded Chicken Sliders make a great appetizer for a party or a filling meal. They can be made quickly using rotisserie or leftover chicken so they are perfect for a busy weeknight and they are a crowd pleaser that kids and adults love! Cut each of the Hawaiian rolls in half across the length of the rolls and then place the bottoms in a 9x13 baking dish. 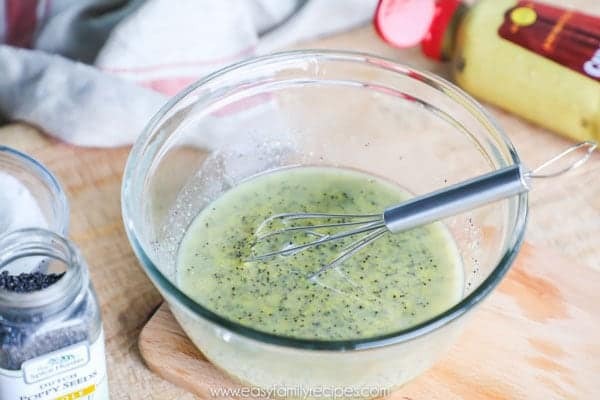 Mix the melted butter, mustard, sugar, and poppy seeds until combined. Then use a pastry brush to spread the mixture evenly over the tops of the rolls. Bake on the middle rack for 20 minutes or until the tops of the rolls are golden brown. Serve hot and enjoy! These chicken sliders look great!! Love your video for this! Sounds delicious. A Similar recipe that is also amazing—I found in a cookbook years ago: spread for inside of rolls: 3 tbsp minced onion (or 1 tsp onion powder in a pinch;), 2 Tbsp poppy seeds, a tablespoon yellow mustard and 1/4 cup softened margarine or butter—mix and spread inside rolls, then layer cheese and ham (awesome for scraps of ham off the bone! ) I wrap the whole thing in foil and bake that way. Amazing on a cold day!! I love this idea! I will have to try it out. THanks for sharing! Made these tonight; followed recipe, no change, even though I was a little leery of the sugar in the mustard-poppy seed topping mixture. Came out great. Everybody loved them. Will definitely make them again.